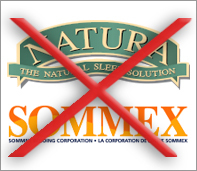 Two years after being saved from closure by its founder, the bedding company Sommex Bedding Corporation, a branch is located on the boulevard Thibeau, Trois-Rivières, closed Thursday noon. The founder, Normand Ricard, was out of retirement in 2013, 10 years after he sold his company to buy. He wanted to avoid the announced closure. Mr. Normand was disappointed not to have been able to save jobs. “I came back to save jobs and I have not succeeded,” he began. After 30 months of work, Mr. Ricard has had to face the facts and place the company under the protection of the law on arrangements with creditors. The notice of intent was sent to the Office of the Superintendent of Bankruptcy Tuesday, but the recovery plan was rejected by creditors. The forty employees of the mattress factory, which has set up shop in the Cap-de-la-Madeleine area, was notified Thursday lunchtime closing. They never have suspected that we would put the key under the door, according to Luc Charpentier, union advisor to the FTQ.